Baked salmon is a healthy meal that is simple and quick to prepare. Start by preheating the oven to 450 degrees F. Lightly brush a baking dish or pan with a small amount of natural grapeseed oil. Place the salmon skin side down in the baking dish. Brush the top of the fish with a light coating of grapeseed oil. Season with salt and pepper or other herb/spice blend you prefer. Put the salmon in the oven for 15 minutes, checking 10-12 minutes to make sure it isn't cooking too fast as oven temperatures vary. Remove the salmon and allow to rest for three to five minutes. See below for other tasty versions. Preheat broiler; adjust rack to highest setting. Whisk together the honey, bourbon, and Hot Pepper Jelly. Place the salmon skin side down on a lightly greased foil lined baking sheet. Brush the filets with the glaze. Broil for 5-6 minutes or until the salmon is cooked to desired doneness. Not technically baked salmon but close enough...and just as tasty. In a large mixing bowl combine the yogurt, cucumber, and 1 tablespoon Tzatziki Seasoning. Once combined add the cooked farfalle, feta, golden raisins, mint, pine nuts, and roasted red peppers. Toss all ingredients together until everything is coated is Tzatziki refrigerate until ready to serve. Preheat broiler. 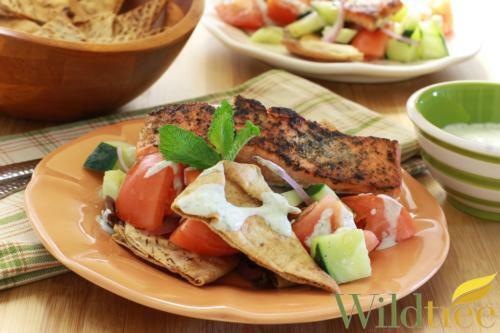 Place salmon on a foil lined sheet pan and seasoning with remaining Tzatziki Seasoning. Broiler for about 15 minutes or until salmon is cooked through. 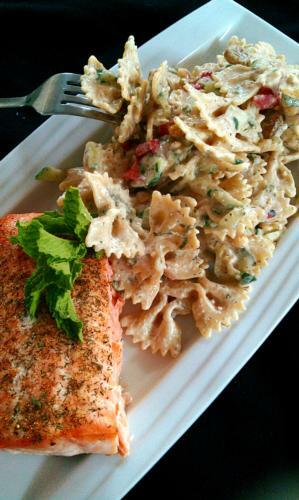 Serve with pasta salad. Preheat oven to 350°F to begin this wonderful baked salmon recipe. Toss pita pieces with 2 teaspoons Grapeseed Oil and salt. Spread in a single layer on a baking sheet and bake for 10-12 minutes or until crisp. Remove from oven and set aside to cool. In a blender or food processor combine the yogurt, feta, mint, lemon juice, 1 teaspoon Tzatziki, and 1 tablespoon Grapeseed Oil until smooth; set aside. In a bowl combine the tomato, cucumber, olives, and red onion. Season with salt and pepper if desired; set aside. In a nonstick skillet heat the Grapeseed Oil over medium to high heat. Season the salmon with the remaining teaspoon Tzatziki. Cook salmon for about 3 minutes on each side or until golden brown and cooked through. Divide pita chips among 4 plates. Top with the tomato salad and drizzle with the yogurt dressing. Top each plate with a salmon fillet. Garnish with mint if desired. Preheat oven to 450°F. Prepare Pizza Dough crust to package recipe and stretch dough out to an even round pizza. Use a fork to poke holes through out the base of the pizza so that it doesn’t rise while baking. Whisk egg and milk to create egg wash, brush egg wash around the crust of the pizza and sprinkle Everything Spice on crust to full coat. Place pizza dough on an upside down cookie sheet and bake for 10 to 15 minutes. While pizza crust is baking, combine lemon zest, dill, and cream cheese. When pizza crust is done baking, allow crust to cool. When crust is fully cooled begin to top pizza by first spreading the dill and lemon zest cheese spread on the bottom. Next top with tomatoes slices and then smoked salmon pieces. 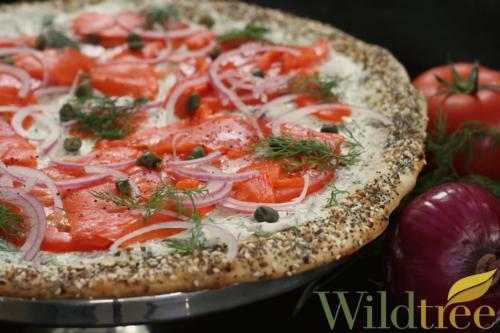 Finally place slices of red onion and the capers evenly throughout pizza and garnish with extra sprigs of dill if desired. Enjoy this excellent version of baked salmon. Preheat oven to 375° F. In a small bowl, combine Rodeo Rub and sugar. 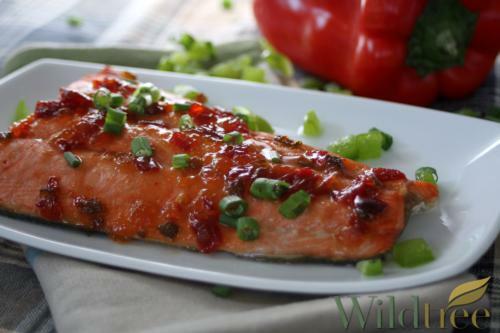 Generously coat the salmon filets (no need to coat the side with skin) with the sugar mixture. Heat Grapeseed Oil in large non-stick oven proof skillet over medium-high heat. Carefully place the salmon filets in pan, seasoned side down. Cook 2 minutes and flip. Place pan in oven for 6-8 minutes, or cook fish to desired temperature. Serve with a Wildtree sauce of choice. Simple and easy baked salmon! Preheat oven to 425°F and grease baking dish for this baked salmon recipe. Place salmon in dish. Mix Slow Cooker Sauce with brown sugar in small bowl, brush on salmon. Bake salmon 10-20 minutes, depending on thickness of fish pieces. Fish should flake under slight pressure.